Are you planning to tie the knot with your partner and have the grandest wedding you ever dream of? Some people can get you started and help you with your wedding needs - from real life newlywed couples to the country's premiere wedding suppliers. 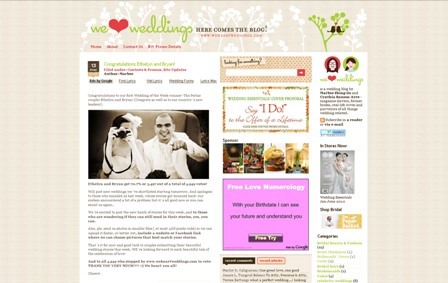 The country's most creative wedding blog, www.weheartweddings.com has just been unveiled on May 18, 2010 at The Blue Leaf Events Pavilion, McKinley Hill in Taguig City. The web site is owned and maintained by the Wedding Essentials magazine. This creative wedding blog is a design and style-savvy wedding resource site that is devoted to the modern and innovative Pinay bride. From gorgeous, real weddings to young and new wedding suppliers as well as seasoned pros in design, event styling, fashion and photography, weheartweddings.com has everything you will ever need and desire to make your wedding a beautiful and memorable one. Want an eco-friendly wedding or a modern, 21st century theme? Read tips, advice and real-life stories from Marbee Shing-Go (current Editor in Chief of Wedding Essentials) and Cynthia Bauzon-Arre (former creative director of the magazine), as well as other brides and grooms to inspire you. Weheartweddings.com is updated at least four times a week and features chic wedding-related content and looks beyond the regular cookie-cutter ideas to give you inspiration for an event that is both personal and incredibly charming. The fun blog also features simple DIY (do it yourself) tips and tricks to help you make your own wedding invitations, souvenirs and even corsages. From wedding photographers and garden venues to make-up artists and photo booth suppliers, weheartweddings.com has got you covered to help you have a beautiful, memorable wedding. The Chance of Saying "I Do"
The launch of www.weheartweddings.com not only gives you a whole wealth of wedding information on your fingertips, it also gives you the chance to say "I Do" to a once-in-a-lifetime offer - it's a proposal from Wedding Essentials that you shouldn't dare miss. We Heart Weddings' first online promo, titled "Say I Do to the Offer of a Lifetime" gives you the opportunity to be featured on the cover of Wedding Essentials’ Beautiful Weddings issue. Tell us how your wedding day was beautiful—from the gown you picked to the food you served—and YOU could be on the cover of Wedding Essentials’ Beautiful Weddings magazine! We will feature wedding stories at our blog, www.weheartweddings.com and throughout the week, readers will get the chance to vote on their favourite wedding story via an online poll. At the end of each week, we will announce the Wedding of the Week winner as determined by the votes received in the poll. This promo will run for ten (10) weeks ending in July 18, 2010. • The WE Editorial Staff will pick five (5) of their own favourite wedding stories. These 5 Editorial Staff picks and the 10 Wedding of the Week winners will each receive a WE gift bag worth Php3,000 from our sponsors, AND be featured in our Beautiful Weddings, October Issue! • BEST OF ALL, each of the 15 wedding stories we feature will have their own cover AND be invited to the Beautiful Weddings - October Issue Launch where they will receive one (1) complimentary copy of Beautiful Weddings with their own wedding on the cover. Entries must be (a) 600-800 words in English, (b) expressed details of the wedding in blog or photo essay format in your own voice, (c) include 3 tips for soon-to-wed readers and (d) come with 8-10 photos and link to the Face Book or weddsite wedding photo album. For the full details on this promo, visit www.weheartweddings.com.